Will People Know I'm Using SmarterQueue? Each social network has different rules for how your posts will be treated when published by third-party tools. Posts published to Facebook personal profiles and groups via SmarterQueue will display a SmarterQueue link. This is not advertising on our behalf, this is something that Facebook requires, as they force apps to be displayed on personal posts. While some other tools allow you to create your own Facebook app to bypass the tool’s own branding, this is not something officially supported by Facebook and places you (and your posting ability) at risk of being shut down. 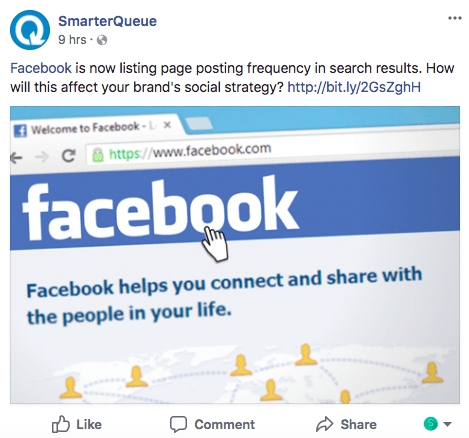 Facebook Pages, on the other hand, display a “Published by SmarterQueue” link, but it is not visible to your Facebook followers. This is only visible to the page admins. Displays a “Published by SmarterQueue” link, but it will not be visible to your Facebook followers (i.e. only page managers will see this). The post will appear to be published by the Page itself. 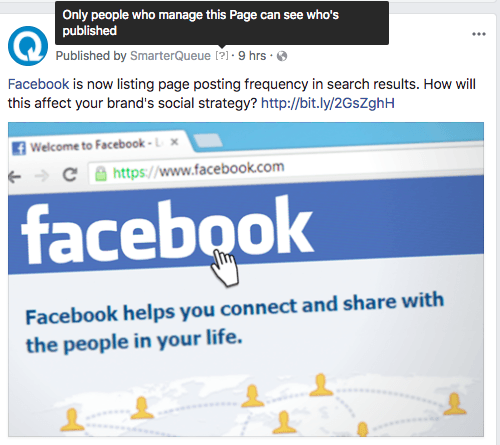 The reason Facebook shows this is to Page managers is so that you and other Page admins can keep track of who added the posts to your page; whether they were added by you, another page admin, or an app you use. This is how the post will appear to page admins. Your followers will not see any branding. Displays a small grey “SmarterQueue” link above the post. The post will appear to be published by the personal profile that you used to connect the group to SmarterQueue. At this time, Facebook does not allow us to publish to your Group as a linked business page. The reason Facebook shows this is so that you and other Page and Group admins can keep track of who added the posts to your page; whether they were added by you, another page admin, or an app you use. Your followers won’t see any indication that you’re using SmarterQueue to publish your posts. The only exception is if you publish a video that is longer than 140 seconds. These longer videos can’t be published natively on Twitter, so we host them on our own servers. Your audience will see a link to your video in your post, that points to the video hosted on our servers. Text posts to LinkedIn will show no indication of being published with SmarterQueue. LinkedIn’s API restricts third-party apps from publishing images and videos natively. So, we will host your images and videos on SmarterQueue servers. 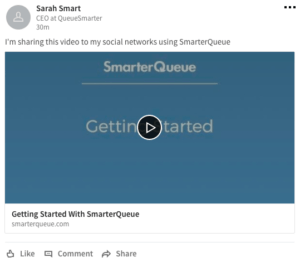 If you post an image or a video to LinkedIn, your audience will see a SmarterQueue link pointing to your media hosted on our servers. On Instagram, you publish your posts yourself (with help from SmarterQueue). We don’t post on your behalf so your audience will not know that you are using a scheduling tool. On Pinterest, you can create and publish your own content or re-share content from your boards and boards you follow and there will be no indication you are using SmarterQueue.